Your thigh workout will also tone your glutes, calves and hips. The key to thinner thighs is a balance of cardio, strength training and diet. Intense cardio will burn calories and a healthy diet will provide your body with the fuel to be active. Strength training paired with stretching will then build lean muscle, shaping and tightening your thighs. Get the fastest results by working out for one and a half hours six days a week with a varied routine that will avoid boredom. An intense cardio workout burns calories and sheds fat. This is the most important factor because even if you achieve muscle tone it will be invisible under any excess fat. At the gym alternate between an hour on an inclined treadmill and the stationary bike at a high resistance. If you don't make it to the gym, then step outside and run or jog for one hour. 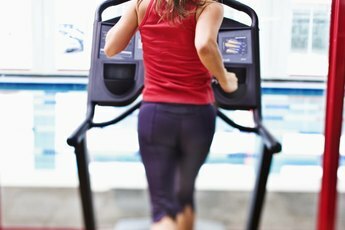 According to the Mayo Clinic, a 130-pound woman will burn on average 600 calories running on a treadmill or 450 calories on a stationary bike. Building lean muscle mass is key to shapely, slender legs. At the gym do two sets of 15 repetitions on the adductor, abtractor, leg press, leg extender and leg curl machines. Choose a weight by testing with low weights and edge it up until the last repetition is challenging but possible. Using too light of weights will not build the muscle tone you need. Follow this routine each time at the gym unless you're sore, in which case you can take a day off. Stretching is important for any new exercise routine to warm up muscles before a workout, prevent injury and increase flexibility. Prior to your cardio spend five minutes going through some basic stretches including calf raises, walking lunges, hamstring stretches and quadriceps stretches. If you find yourself sore or aching, you can replace a day of cardio with a yoga class. Attend a beginner class or Vinyasa yoga; these will be basic sequences that focus on breathing and slow, controlled movements. Losing excess weight will slim your thighs as well as the rest of your body. A diet that is high in lean protein, whole grains, fruits and vegetables will support your workout while slimming your waistline. Do not eat less than your recommended daily caloric intake in an effort to lose weight, as this will only sabotage your workout, leaving you sluggish and unable to build muscle. Determine your recommended daily calorie intake with the Mayo Clinic's calculator.